School is almost out and kids are looking for new activities now that the weather is warmer. There are plenty of May activities for families to enjoy together, including learning opportunities, creative projects to try, and outdoor ways to play together. If your child hasn't picked out a summer camp option yet, now's the time to buckle down and find a camp. The summer camp guide walks you through every step of the summer camp process, from lowering your summer camp costs to how to prevent summer camp homesickness. This is the time of year charities host more events to raise money for their causes. Your entire family can participate in walks, bike- and trike-a-thons and even jump rope-a-thons. Look for charity events for the whole family to get involved. May is National Bike Month and that's just as good a reason as any to dust off the bikes, put on the helmets and start riding. 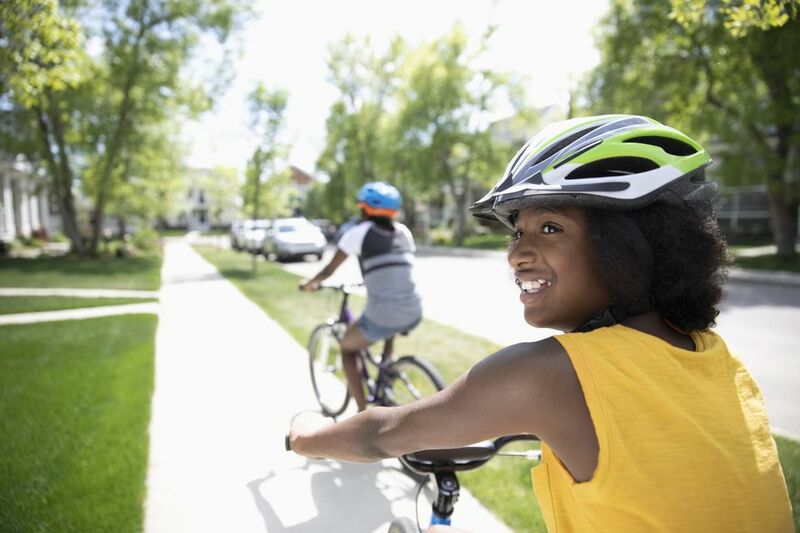 Follow the kids' bike sizing guide and check the fit of each helmet to keep your family safe. For the little ones who aren't quite ready to ride just yet, a bike trailer is a great way to take them along for the ride. Plant a garden of flowers with your children this month. If you don't have a yard big enough to accommodate a flower garden, plant a mobile garden in a bucket. Who doesn't love a month that celebrates playtime? National Physical Fitness and Sports Month encourages your kids to get up and get moving. Outdoor activities and warm weather fun will keep your kids from parking it on the couch and playing video games. Explore world cultures with your kids during Asian-Pacific American Heritage Month. Try origami crafts with your children and feast on steamed rice while teaching your children about the history and culture of Asian-Americans. Yes, that green veggie gets its own month. Instead of plopping a plate full of asparagus in front of your children, start by teaching them about asparagus. Next, try a pickled asparagus recipe the kids won't be able to resist. Even if your children don't suffer from asthma or allergies, they probably have friends who do. Take this month to teach your children about these medical conditions. They can learn what happens during an asthma attack and how certain triggers can affect kids with allergies. By explaining asthma and allergies to your children, they can better understand what their friends may be going through while not being scared if they're ever-present during an attack. One of the purposes of Better Hearing and Speech Month is to get more people in for hearing loss testing. Check with your child's pediatrician to find out when she should be tested. You can also use this observance to teach your children sign language. Even babies can learn sign language. Dad will surely want to get involved in this celebration. Fire up the grill and start barbecuing together. Grill vegetables, fruits, and other barbecue recipe favorites to enjoy family meal time together. You don't have to save green eggs and ham feast just to celebrate Dr. Seuss's birthday. Eat them during National Egg Month. Or put a twist on the month by learning about dinosaur eggs, shark eggs or lizard eggs. Round out your month with egg carton projects or make egg critters to get in on the fun. Darling ducklings take center stage during National Duckling Month. Create duck crafts, sing a duckling song and learn fun facts about ducks. Celebrate that yummy patty sandwiched in between two buns this month. Get some hamburger facts, try new hamburger recipes and make your own hamburger buns. It can be hard for younger children to understand mental health. But by working with them, you can teach your kids empathy toward others. They'll also develop their social skills simply by understanding how we are all different and that's okay. Get your kids to eat healthier. Make fun salads your children will devour. Even your picky eaters will love salad. Sweet! Grow strawberries at home or pick some up at your local farmer's market. Give the kids a lesson on strawberries, then step into the kitchen to make delicious treats like chocolate-covered strawberries or strawberry shortcake together. Kids are often told to respect their elders but they're not told much more beyond that. Older Americans Month gives you the opportunity to explain to children why their elders are so important. Their grandparents can be perfect examples too. Tidbits about today's grandparents show kids why their elders should be respected. Your child's favorite mode of transportation is probably by bike, scooter or wagon. The history of transportation is a great way to teach your children about the evolution of how we move things and ourselves from one place to the other. Have fun with air, ground, and water transportation crafts too.